Breastfeeding not allowed? The case of Amy J.
Amy J. is an American citizen who lives in Norway. In July 2013 her worst nightmare began. Without any warning, the Norwegian Child Welfare Services known as ‘Barnevernet’ accompanied by police knocked at her door, saying that her 19-month-old son Tyler had to be taken to a hospital for an examination immediately. What happened? In the weeks leading up to the taking of Tyler, the young mother was increasingly concerned about the growth curve of her 18-month-old son. Tyler did not yet want to move to more solid food but instead continued to prefer breastmilk. Tyler was Amy’s first child, so she lacked the experience to know that children can develop quite individually. But, being a concerned mother, Amy even took Tyler for medical check-ups three times a month in order to monitor the growth process very closely. Then, came the summer. Amy went on a vacation with Tyler to America for two weeks and visited friends and relatives. But, as soon as they returned back to Norway, the child welfare service, together with the police came to her house, saying that Tyler must be examined immediately in a hospital. Amy found out later that someone had alerted the youth welfare office in order to maliciously harm her. Being completely overwhelmed by the situation Amy agreed to go to a hospital with them. Also, Kevin M., the Norwegian father of the child came along. At the hospital a doctor diagnosed Tyler as “slightly underweight.” The boy would have had to weigh 10 kg, the doctor said. But Tyler weighed only 9.6 kg, which is actually not a reason for a concern according to the weight charts. The doctor also criticized that Amy was still breastfeeding her son. Instead of offering advice to improve the nursing, the employees of the child welfare office now wanted to intervene on the basis of the medical diagnosis and remove the child from the mother. This led to a verbal confrontation which the father filmed with his smartphone. It’s a scene that can now be found on Youtube. “When will I see my son again?” Asked Kevin M. “We cannot tell you that yet,” replied one of the employees of the child welfare office. Finally, Kevin was ejected from the hospital as the argument got louder and louder. What followed next was like a scene from a Hollywood movie. Kevin went back to the hospital and put on a doctor’s outfit. In disguise, he was able to go to room where his little son Tyler was taken in the meantime. He took his son unnoticed, left the building in a hurry, and drove around the area aimlessly, knowing that these might be the last moments with his son. Finally, he was stopped by several police cars. One police officer on the roadside even threw a big stone at the car, which nearly hit his child. Kevin was then detained for one night for attempted child abduction. He was released the next day, because a judge realized that Kevin was the biological father and he still had parental rights. However, little Tyler remained in the care of the Norwegian child welfare office. For the time being the parents still had the right to visit and occasionally see Tyler – in a police station behind double-locked doors. But, a year later the visitation rights were cancelled. The authorities saw a potential abduction risk as Amy is an American citizen and they didn’t want her to take Tyler to America. In the following court trials this was also the main argument for removing parental rights from both her and Kevin. On September 22, 2014, Amy saw her son for the last time. Up to now both she and Kevin don’t know where Tyler is and how he is doing. In order to hide the child’s new whereabouts, the authorities changed Tyler’s name twice. At the age of four years old, Tyler already had three different names. And, why did this happen? The Norwegian Child Welfare Services stated that they acted only in the Child’s best interest. But, how can such traumatic experiences serve the best interests of a child at such a young age? Especially, in the first years of life, the love and affection of the biological mother are known to be of great importance for the healthy development of a child. Meanwhile, Amy has gone through all legal options in Norway to get her son back. In the spring of 2016, the case was rejected by the Norwegian Supreme Court. But, Amy doesn’t want to give up. Through a Christian initiative in Vienna / Austria, Amy was able to get in contact with international lawyers. They looked at her case documents, discovered Human Rights violations and helped her to file the case to the European Court of Human Rights. Also, the Christian initiative in Vienna showed further interest in the case. They launched a campaign on Facebook in order to raise awareness for Amy. 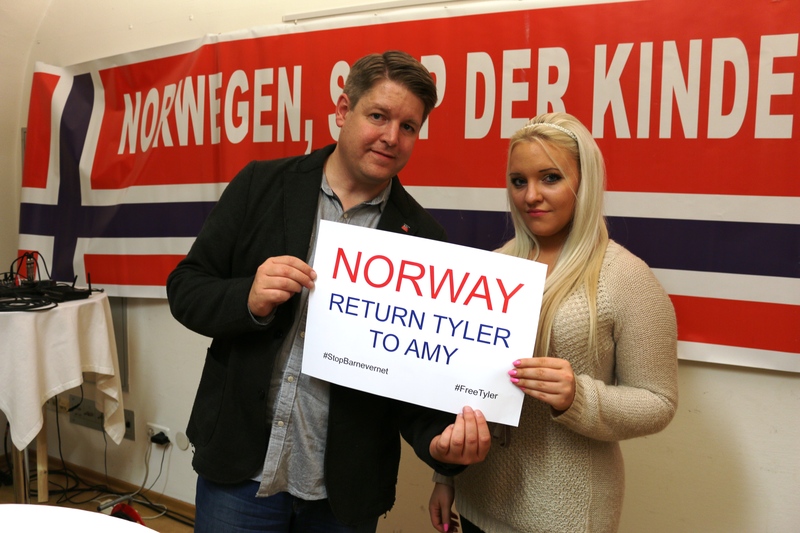 They challenged people to post a selfie of themselves holding a poster which stated, “Norway, return Tyler to Amy”. It is still uncertain how the case of Amy J. will end up. Once again, a family in Norway was torn apart for no good reason. Once again, a child in Norway was sentenced to extreme traumatic experiences. And again, we are supposed to believe that it served the welfare of the child. After the many worldwide protests and media reports, the government in Norway has repeatedly stated that it wants to look more closely into their child care system. But, so far Norway clearly fails to implement anything. Björn comes originally from Germany. He is a radio station manager for a private Christian Radio broadcaster in Vienna / Austria. He is married to Hee-Jung from South Korea and they have two Children. My comment: Amy’s is one of the three cases I am following in “Recent Accounts of Children Taken” at the top of this blog. Her story is bizarre yet, she is not unlike so many others in Norway. I have known Bjorn for awhile now. I respect his continued efforts to help families like Amy’s. This entry was posted on Thursday, December 21st, 2017 at 1:10 PM and is filed under BIG GOVERNMENT, Commentary, Education, News. You can follow any responses to this entry through the RSS 2.0 feed. You can leave a response, or trackback from your own site. 12 Responses to Breastfeeding not allowed? The case of Amy J. Thank you for the reblog, Pastor Barsan. It is a sad story but one about which people need to be aware. This does not mean that people should not try to get their cases up before the Strasbourg Court. But the only hope is that that will help generally and in the long run, plus that it may make the national authorities give them some more visitation rights etc – but the authorities’ reaction is usually the opposite: they claim that now the child is so attached to its foster parents, or it has been adopted away (forced adoption), and it must not be disturbed in its present, idyllic life. Maybe I should have called it “depressing”, not “depressive”, but it is all rather depressive anyway . . .
Am I correct in understanding that the recent decision involving a Norwegian case at the ECHR took 11 years to get resolved? And am I correct that the decision went against the Norwegian family involved? Am I also correct that the vote was 3-4 with a Norwegian Judge sitting at the EHCR making a crucial vote against the family? If I have all of this right, or even just one of the three, three votes is not enough to console me as it has some people. The whole thing stinks worse than the skunk I saw on the road the other day. You have shared a link with valuable information that anyone who is interested in this subject should read. It takes a little time to read but it is not difficult to grasp (it is not “legalese”, if you get me). The judges who voted with the Norwegian judge and found Norway had committed no violation were from Germany, France and Austria. The three judges who dissented were from Ireland, Bulgaria and Azerbaijan. I am sure a skunk has respectable reasons for stinking: to protect itself, probably. The same cannot be said for this nation. I have seen some comments on the web that people think the Norwegian judge should have been declared incompetent to sit in judgment on Norway. This, however, is not so. In all cases before the European Court of Human Rights, the judge from the country being complained against is required to be on the panel. (google may translate it quite well if anybody wants to read it, and for any remaining questions you can ask me). Thank you for helping me to know that I had my facts straight, Marianne. One of my Facebook friends is an activist in Austria and I’m sure he was disappointed with the judge representing his country. In fact, he is the young man that wrote this article! Your point about the skunk is well taken. The little fellow is only trying to survive, just like the victims of the Norwegian NCWS. I appreciate (and I hope the readers of this blog do as well) someone with your knowledge who is willing to spend some time here to help us understand such a serious issue. Two Norwegian CPS supporters are SO glad that the Strasbourg Court seems, in the judgment in the Lobben case, to become more “child oriented”. One of them, Marit Skivenes, I have seen write and give speeches before. She is very much part of the “child protection” system. Here, she and the other writer show that they take for granted that the CPS and their associated experts (such as themselves) are always both right and honest and that parents are trash when the CPS wants their children. That is very much the content of what I have seen from Skivenes previously also. familien-er-samlet (the family is together) is a father who saw the dangers in time more than 4 years ago and managed to get his whole family out of Norway. They are established abroad and are doing fine (of course). This father has written many interesting and good analyses of aspects of Norwegian CPS. His comments here speak for themselves. I am so glad you linked directly to this, Marianne. As the man who wrote this left Norway because he felt his children were in danger of being stolen by the CPS, I think he has a unique perspective. The fact that he has done well after leaving Norway also illustrates that Norway is losing good people in more ways than one. It is very unfortunate that he sees Western culture in this light. I must admit that I’ve never felt this statement has been true in the U.S. during my entire lifetime, in spite of the attempts to create a nanny state by those like Hillary Clinton. This statement means that either this father who left Norway to save his children from the government is not quite so accurate in his assessment or that he was in the environment as he describes it. I think the latter is probably the true case. I think that parts of Europe are particularly bad, particularly Norway and the U.K. I have gotten mixed feedback about Sweden but I know that some feel Sweden is the worst on this human rights issue. In any case, the U.S. is more vulnerable to this unGodly view than it ever has been. This determination is based solely on my experience and quite a bit of reading I’ve done in the past few years. I hope I’m mistaken. One thing is good. All seem to understand that Norway is in the spotlight. That is a very good thing. Thank you for sharing, Marianne. Is the world that bad or are these “indexes” not indicative of glaring and incompetent CPS policies? I did go back and finish the second link. The two CPS supporters write an article that means nothing when one looks at the reality of what is happening in your country. I say “hogwash” to this assertion. I am ashamed that an American named Hillary Clinton pushed for a nanny state. She was mostly unsuccessful even though she created problems with her views. When did Norway (and Hillary) decide that the traditional view is not the best for the child? I’ll attempt to answer this. The whole mess is decades in the making and now we are living with the repercussions that you would call “psychobabble.” That’s exactly what it is, Marianne, and it shouldn’t take a professor to know it. It is, however, important to have academia’s input in this issue. I know that a handful of Norwegians with better than four years of college have spoken and written out against the inhumane policies that have taken control of your country and it is much appreciated. Sadly, there are not near enough of these types sounding the alarm. I think they should be in the forefront of the battle. I suppose they don’t want to ruin a good “reputation” or take a risk that they might suffer financially. All the while, the children scream as they are being dragged from their own homes. I have stated a Biblical truth about this issue many times before and feel it necessary to repeat it; those who are responsible for such crimes will reap what they have sown.